We have been going to Willow Tree for the last couple of years and usually visit in the spring and fall. The campground has large sites, I believe these sites are about as large as we have ever stayed in. Most campground utilize smaller sites trying to fit in as many units they can. All sites are paved pull-thur with a patio, no cable and slow wifi. As a side note our Verizon signal was slow too. This is probably the cleanest campground we have been too. They have a camp store, laundry, game, and exercise rooms. Large pool, hot tub and a lake for swimming and fishing. There are some long term units and it’s a favorite snow bird location. We met three other couples from Hope Mills and Fayetteville NC. Most of our camping weekends are with one or more of these families. They all arrived by dark on Friday evening and we were excitedly waiting for the arrival of our friends, who have purchased a new 40FT Tiffin DP. They purchased the Tiffin at Lazy Days in Florida during April and this was there first camping trip. They rolled in and set up like pros and the coach sure is pretty and I know that they will enjoy it. They are in the process of downsizing and selling there home to become full timers. Both plan to retire in December. No better way to start Saturday, then with Barbara and Robert cooking the sausage and bacon for breakfast. Jane flipped the pancakes for everyone. LOL all I had to do was show up. A time of fellowship was had and then it was time for Robert to give me a in depth tour of the outside bay areas of his Tiffin and all the cool gadgets it has. All I can say is…..I was impressed! That coach has a lot more “stuff” than our Windsport does. The day was beautiful with plenty of sunshine, it was a little windy which kept a good breeze going. Had time to tinker around the motorhome and even got in a bike ride around the campground. country boil.” Ricky, with Tina taking care of the timer fixed up a pot of potatoes, sausage, corn and shrimp that was enjoyed by all. The wind calmed down by dark and we were able to enjoy time together around the fire ring. Ricky popped us some popcorn for dessert. All to soon, it was Sunday morning and time to pack up for our return trip back home. The weekends always seems to be so short when you are out enjoying time with friends and on the road with the motorhome. Check out time was 12:00 so it was back to reality as we hit the road back to Wilmington where we got things put up and got ready for the work week to began. Tammy and I are looking forward to when we will be able to hit the road for more then just the weekend seeking fun and sun! Thanks for visiting our site and please come back. Tammy and I finally got back on the road to spend Easter weekend down in Mrytle Beach SC at Briarcliffe RV Resort with our good friends Mark and Jane. This was our first overnight trip this year and I spent Tuesday and Wednesday getting the motorhome ready. I drained the antifreeze out of the fresh water tank and closed all the connections. We keep it at a storage facility so I don’t have access to water, which meant I couldn’t put water pressure to the system until we got to the campground. So we are crossing our fingers that when we hook up that the motorhome doesn’t become a sprinkler system. I also installed a Tire Monitoring Pressure System (TMPS) on the motorhome. It’s a neat wireless system that monitors each tire’s air pressure and temperature. Most causes of tire failure on the road are the tires running to hot or to much or to little air pressure. It took me awhile to get it programmed, but works good and let’s you see the air pressure and temperature of each tire as up roll down the road. It also alarms when a tire get’s out of the settings. We left Wilmington on Thursday morning and headed south on Highway 17 to Myrtle Beach SC, planning to stay until Sunday. Weather was good and traffic was light. Briarcliffe is located on N. Kings Highway, beside Barefoot Landing and the GPS took us around on Hwy 31 and Hwy 22. This dumped us back on Kings Highway south of the campground and being that we were towing the Jeep, we had an easy left turn into the campground. Check in was simple and painless except for the price, rates this time of the year are running about $73.00 a night and they also have a high tax which is added in. Their store was small and the office was only open from 8:30am – 5:00pm during the month of April. Everything locks up at 5:00pm, the only way to enter the campground is entering the gate and you have to give a $10.00 deposit for the gate key. This is also a membership campground and a lot of the folks I talked with were members. It sounded like a good deal if you wanted to go there a lot. Check out their website for further information. Now to be fair it was a nice campground and we would go back sometime. They have a nice clubhouse and pool located at the back of the campground on the Inter-coastal Waterway with a boat ramp, they also had a small kids putt putt course. They have church services on Sunday at the clubhouse also. The back of the campground had park models set up and some long term RV’s. The area was very clean and everyone had things fixed up real nice. It looked like most of the folks back there were retired. Saw a lot of New York and Pennsylvania license plates parked around. Our weather was beautiful, it rained just a little on Thursday evening and after that it was clear sailing. Had a great time with our friends Mark & Jane who are enjoying their Forest River FR-3. We had good times exploring the campground, riding our bicycles checking out our neighbors and the area. Also enjoyed good food, had some time to rest and enjoy the slower pace for a couple of days. Mark & Jane enjoying the afternoon. However, I did contribute to the local economy a little bit to much. If you are familiar with Myrtle Beach SC, you know that it is very commercial and a vacation hotspot. The campground is located right beside Barefoot Landing, so of course we had to go there, and Tanger Outlets, Camping World and the Kite store to name a few. But it was fun. Sometimes when we go camping for the weekend, we won’t even leave the campground, but these trips like this are different. This was a great weekend, we had a lot of fun, enjoyed time with our friends and looking forward to the next trip seeking fun and sun! Thanks for stopping by and please check back! 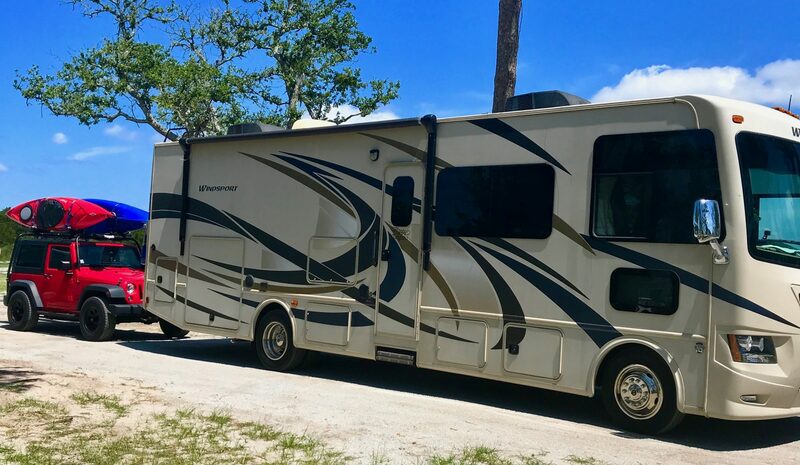 Tammy and I hit the road to check out a campground in Swansboro NC, and took advantage of stopping by and checking out Hammocks Beach State Park which is off Highway 24 near Swansboro. The state park is unique that the visitors center, kayak launching area and dock for ferry boat is the only thing on the mainland. The main attraction is the three primitive islands (Bear, Huggins and Jones) that are located off the mainland with one side facing the Atlantic ocean and the other being in the marsh lands. Bear Island is about 2.5 miles from the ferry dock and has primitive backpack camping, a designated swimming area, bird nesting areas, picnic shelters bathhouse and a concession stand which is open Memorial Day through Labor Day. Bear Island contains 892 acres bordered by the Atlantic Ocean to the south and by salt marshes, estuarine creeks and the Intracoastal Waterway to the north. It has about 4 miles of white sandy beaches, shrub thickets and maritime forest. Early in the twentieth century, Dr. William Sharpe, a neurosurgeon from New York, came to Bear Island to hunt. He fell in love with the area and brought it after his retirement. He intended to give the land to John Hurst who was his long time hunting guide. Hurst persuaded him to donate it to the North Carolina Teachers’ Association, which was an organization of African American teachers. In 1950 the group attempted to develop the Island, but limited funds and the island’s remoteness rendered their efforts unsuccessful. In 1961 the association donated the island to the state of North Carolina for a park. Huggins Park is located east of Bear Island, at the mouth of Bogue Inlet and is visible from downtown Swansboro. The island consists of 115 acres of upland area and 96 acres of lowland marsh. It is home to a maritime swamp-forest and is listed as a “Globally Rare and Significant Area.” It is ric in North Carolina’s coastal history being a American Indian fishing and hunting ground to being home to a Confederate six-cannon battery from 1861-62. Jones Island has 23 acres, located along the mouth of the White Oak River and is visible from the Swansboro Highway 24 bridge. It is a unique coastal fringe evergreen forest island containing a small wetland area. The eastern painted bunting, a considerable rare breeding bird for North Carolina is known to nest there. We took a few minutes to visit the Visitors Center and browse the exhibits and informationthey had on the islands about the local birds and sea shells that are found in the area. This is at the kayak launch looking toward one of the islands. Most of your state parks have hiking trails, well this one has kayaking trails instead. They have marked trails though the marshy wetlands. Two lead to Bear Island, one takes you to the east side of the island and the second branches off the first and follows the island along the sound front to the ferry basin. The third takes you around Huggins Island. If you like backpack camping along with canoeing or kayaking, this would be a good state park for you. The wind was blowing hard the day we were there and it was cold. This definitely would be a warm, calm day adventure place. So if you are ever in North Carolina around the Jacksonville, Camp Lejeune, or Swansboro areas be sure to check this state park out. Oh, the campground we went to look at was a bust, we’ll be in the Myrtle Beach SC area for Easter. Thanks for stopping by and please come back!